If you’re wondering “can adults get enterovirus?”, come on in to a FastMed clinic and we can help you identify your symptoms. 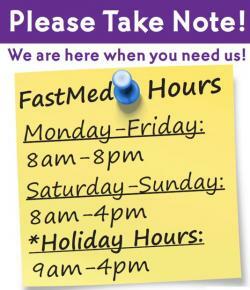 FastMed Urgent Care is a walk-in clinic that can take care of all you immediate, non-life-threatening healthcare needs. We have extended hours and we accept most major insurance providers, so you can get care at your convenience for a low cost. FastMed Urgent Care is a great place to get fast relief when you’re feeling under the weather. Our qualified medical professionals want to get you in and out within an hour. There are no appointments necessary, so you can walk right in anytime between 8:00 am and 8:00 pm on weekdays and 8:00 am and 4:00 pm on weekends. Non-polio enteroviruses are very common, causing about 10-15 million infections in the United States each year, according to the Centers for Disease Control and Prevention. Anyone can contract one of these viruses, so if you’re asking “can adults get enterovirus?”, the answer is yes. With that being said, infants, children, and teenagers are most commonly infected. Enterovirus D68 is one of over 100 types of non-polio enteroviruses, and it seems to be the predominant type of enterovirus this season. Enteroviruses typically circulate in the summer and fall. This season in the United States, 514 cases of EV-D68 have been confirmed. EV-D68 causes respiratory illness, so it can be detected in saliva, nasal mucus, or sputum if you’re infected. If you’re wondering how can adults get enterovirus, EV-D68 can be spread from person to person through coughing, sneezing, or touching surfaces that were previously touched by an infected person. However, symptoms of enterovirus range in severity. Adults who contract the virus are more likely to have no symptoms or mild symptoms. Children may be more severely affected since they have not yet been exposed to these viruses. Symptoms may include fever, runny nose, sneezing, cough, body aches, wheezing, and difficulty breathing. Be careful to monitor children more closely if they have a history of respiratory problems such as asthma or wheezing. If you or your child are having trouble breathing, have symptoms that are worsening, or already have a respiratory illness, contact a doctor. If you or your child are experiencing symptoms or think you may have an enterovirus, FastMed Urgent Care is ready and able to provide quick care and get you on the road to recovery in no time.